In addition to training and bespoke support the Communities First Support Service is offering an increasing number of people in the CF workforce the opportunity to learn from each other via our Outcome Learning Groups (OLGAs). These are based on the methodology of Action Learning. Here, Jane Lewes from The Learning Consultancy, who is working with the CF Support Service to develop the framework for this peer learning, explains the ‘rules’ of Action Learning. Action Learning is being used increasingly frequently as a tool to help community groups to work through some of the issues they have to tackle on a daily basis. The kinds of issues or “knotty problems” may cover just about anything; they can be irritating, frustrating and even the source of genuine distress. Whatever the nature of the problem, one characteristic they all share is that others will almost certainly have experienced the same, or a similar, problem. So, how does Action Learning help to unblock problems and break through barriers? Trust: When a group of colleagues agree to meet as an Action Learning Set (ALS), there needs to be a strong basis of trust – trust in one another and trust in the process. One of the cornerstones of trust is the commitment to confidentiality. An absence of trust will almost certainly cause the ALS to implode and could lead to further damage. The Facilitator opens the floor for the Supporters to pose questions to the Presenter, but NOT to give advice or provide possible solutions! Quality of the questions: The ability to ask powerful questions is essential for an ALS to work. Questions should be designed to help the Presenter identify some new aspect or angle – something that hadn’t previously occurred to them. Questions should be open and focus on the positive, with the tacit assumption that there IS a solution to the problem. The quality of Supporter questions is the key ingredient for effective Action Learning. Outcomes: The aim of Action Learning is to help individuals identify actions they could take to solve a problem or resolve an issue. Each session should begin with an update from the previous Presenter, sharing what has happened as a result of the actions to which they committed at the last Session. It provides a real boost to the dynamic of the Set to hear about positive outcomes. Motivation: When a Learning Set first assembles, members agree to commit to a defined process – regular attendance, adherence to the process, total engagement, confidentiality and so on. As time goes on, if individuals ignore these commitments the level of motivation will diminish and the Set will lose its effectiveness. Motivation to participate is essential as it acts as a spark that ignites energy to “fire and inspire” the work of the Set. If you would like to learn more about how Action Learning could be of use in your role as a member of an OLGA, please contact the CF Support Service on help@wcva.org.uk or 0800 587 8898. Participation Cymru offers a facilitation service for action learning sets that helps to set up a set and facilitate initial meetings as well as monitor and evaluate Action Learning. Would you like to enhance your learning by being able to reflect with colleagues on current work issues? Visit our website for more information. 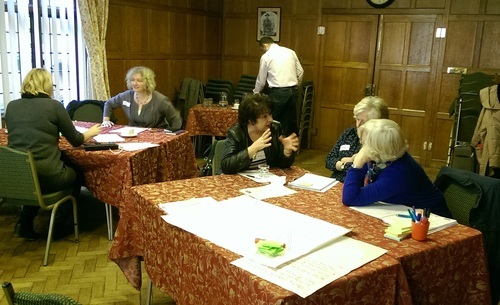 This entry was posted in Guest Blog, Training and tagged Action Learning, Communities First, CoProduction, facilitator, Facilitiation, learning, training on March 2, 2015 by Participation Cymru. Last week Dyfrig Williams promised that I would write a blog post for Participation Cymru. So here it is! I suppose it’s highly appropriate for me to start blogging now as I’ve just been appointed to my new role as Participation Cymru Facilitator and I will be looking after the blog and social media accounts after Dyfrig leaves us for his new endeavour at the Wales Audit Office. I also attended the accredited public engagement training course in Cardiff at the end of April, something which I’ve been hoping to attend for a long time. We covered so much information over the two days, and explored many interesting ideas and fun participative techniques. 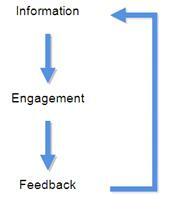 The most interesting part in my opinion was the importance of feedback in the engagement process. I personally believe that the word ‘engagement’ implies that feedback is continuously given from the both citizen and the service provider – in other words – engagement is a conversation, an ongoing process. It made me realise that citizens are also much more likely to want to engage if they know the impact of their contribution. Feedback also gives transparency to the engagement process, and it is empowering for individuals and community groups to know how their ideas are being used. However, adequate feedback does not mean publishing the results of a nationwide survey in a publication that no one reads, or a website that no one visits. The type of feedback given needs to be appropriate and relevant to the type of consultation you carried out. For a small consultation, citizens could receive feedback via direct contact (providing they’ve allowed you to use their details for that purpose, of course!). This approach would show the citizen how much you’ve valued their input as you’re taking the time to get in touch with them individually. For a larger consultation, the mainstream media or social media may be a more appropriate way to provide feedback. The website change.org provide excellent feedback to signatories of petitions. I’ve recently signed petitions through this site and have been sent detailed emails of their progress – when the petition was sent to the relevant person, what their response was and what is going to happen next – which is a great example of relevant feedback. How will you provide feedback to your stakeholders in the future? This entry was posted in Training and tagged citizen engagement, consultation, facilitator, feedback, learning, participation, public engagement, public service on May 10, 2013 by Participation Cymru. I’ve been working for Participation Cymru now for three years, but in a month’s time I’ll be starting a new job with the Wales Audit Office’s Good Practice Exchange as a Knowledge Exchange Officer, so some would say that I’ve left it a bit late to undertake Participation Cymru’s accredited public engagement training! Whilst I feel confident working in the field of participation, I still picked up lots of really useful tips about how I can ensure that I engage more effectively in the future. I found the ‘drilling down’ section of the course the most eye-opening, which is quite scary on reflection as its key to public engagement. It allows practitioners to ensure they’re drawing the right conclusions from the work that they’re undertaking. Gathering a wide range of information: It’s essential that we’re open to a wide range of perspectives – we need to be starting from a blank sheet of paper. Probe and check: We look at the responses and the conclusions that we’ve drawn from them to double check that we understand the points that are being made. Prioritise, or come to conclusion: We have an informed scope of responses. This fit the description of the funnel that we were given – being open at the start, and then refining the information so that we have focussed information at the end of the process. All this sounds like it should be obvious, but after the first two days of the course I feel much better prepared to put all this in to practice, especially as we were given participatory techniques that we could use to make it happen. 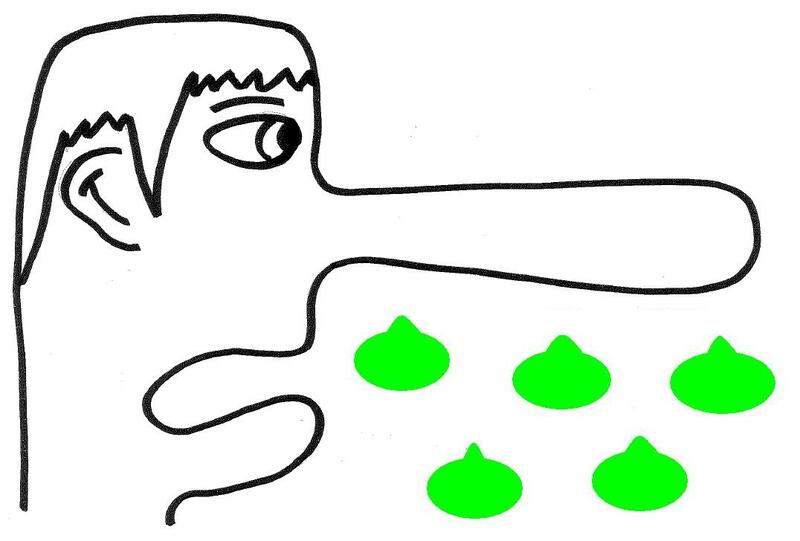 Tools like Snot Man (which was invented by Vicky Butler and its my personal favourite, where we ask what’s ‘snot fair’, with answers given on green post-it’s the colour of snot – classy!) can be used to generate feedback, and tools such as ranking techniques or value continuum (where people order themselves in a line, with each end representing opposite extremes of opinion) can be used to prioritise responses. My colleague Sarah Ball also attended the course and is going to blog next week about what she learnt from the course, so I’m intrigued to hear how her learning from the course differs from mine! This entry was posted in Training and tagged citizen engagement, consultation, demopart, drilling down, learning, participation, public engagement on May 1, 2013 by Participation Cymru.